Happy Sunday! This morning I made myself a delicious, quick and easy "Breakfast Bowl" for breakfast. I had a small bowl of leftover scrambled eggs with cheese from yesterday morning's breakfast along with 2 leftover strips of cooked bacon. I gently reheated them at low heat in the microwave and proceeded to layer my bowl. 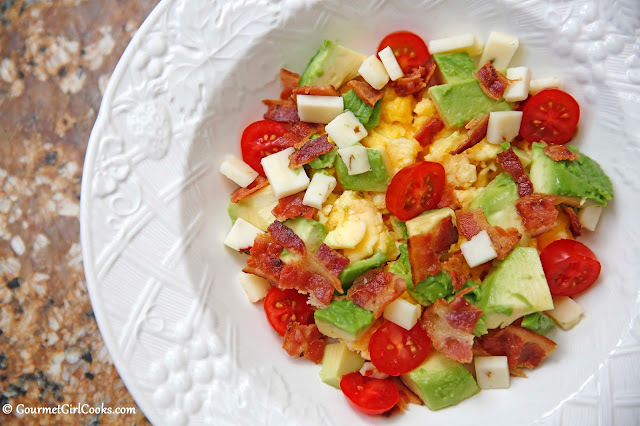 I started with a base of scrambled eggs and then topped them with half of a diced avocado, a couple of sliced grape tomatoes, crumbled bacon and a bit of diced pepper-jack cheese. Voila...I had a delicious, quick and easy Breakfast Bowl. I love mixing together odds and ends leftovers and transforming them into something special. What lies waiting for you to transform in YOUR refrigerator? Enjoy!